Here is novel idea from well-known free flight modeler Bill Hannan and hobby shop owner Russ Barrera. 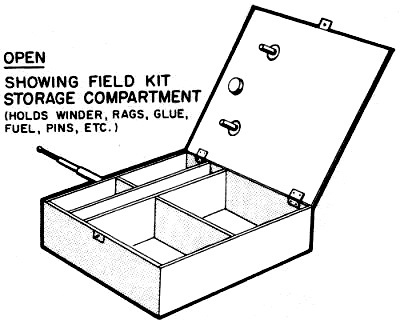 The pair converted an unused transmitter case into a handy field box for use with free flight models. 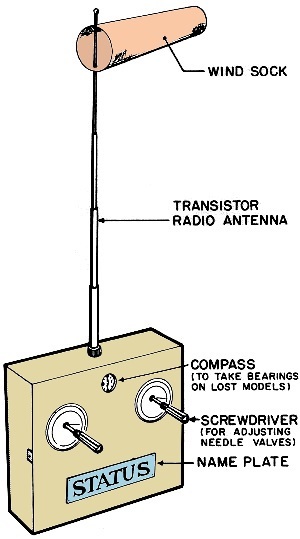 In addition to adding a hinge and latch to the cover, the retractable antenna sports a small wind sock for judging launch times and even a compass in place of the RF power meter to note the direction of your model as it drifts off into the wild blue yonder when the dethermalizer fails to trigger. 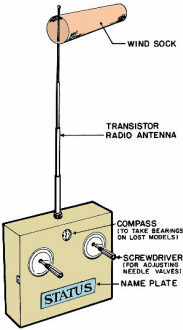 Transmitter turned into free flight field box! Up your prestige at low cost! What's wrong with free flight? Nothing, actually. 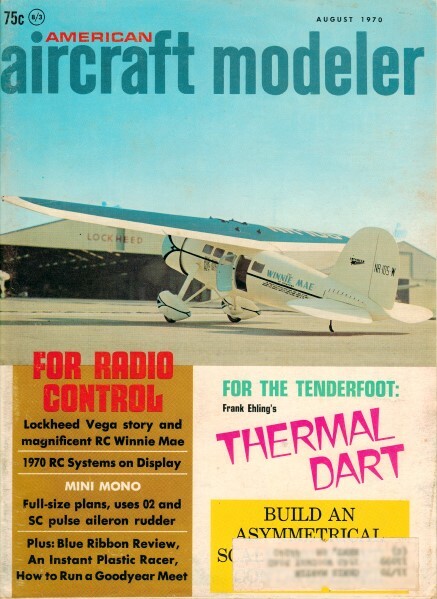 It is just that it lacks that certain charisma associated with more esoteric forms of model flying. Thus, the average free-flighter suffers from feelings of inferiority and rejection at his local flying field. In analyzing the causes of this type of complex, we reached the conclusion that the problem stems from the fact that free-flighters have no symbols of status in the model-building community. Like the Cowardly Lion in The Wizard of Oz, who needed a medal before he could feel brave, and his friend the Scarecrow, who needed a diploma before he would rely upon his own brains, free-flighters need some tangible sign of recognition in order to regain their former high position of respect. Details of our prescribed panacea are disclosed herewith. Merely equipping yourself with one of these easy-to-construct tokens of social rank will do much to assure your acceptance on any flying field, and most assuredly will bolster your ego in the process. Particulars of fabrication are self-evident, and the choice of materials is left to the discretion of each patient-er-builder. Naturally, for maximum snob appeal and for reasons of aesthetics, your project should be finished in a manner befitting such a piece' de resistance. Inset emeralds are suggested, but if that approach seems a bit gauche, a simple application of genuine gold leaf, unborn mongoose skin, or lapis lazuli will suffice.